Introducing… Amanda Keyte. 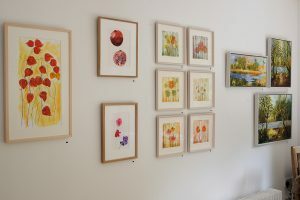 To celebrate our fourth birthday we’re putting on an exhibition that brings together a selection of professional artists we’ve worked with since we entered the Frome art scene in 2015. One such artist is Amanda Keyte. Amanda suffered from a stroke in late 2016. It weakened her left side, leaving her with limited movement in the left arm, hand and leg. As part of her recovery she sketched every day, alternating between hands to strengthen the left one. She generated a body of work during this period from spring to autumn 2017, and beyond. 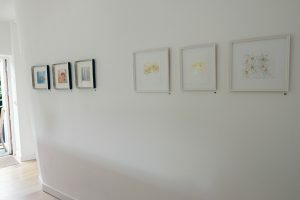 The results were exhibited at her house and studio during Frome Open Studios 2018. The piece we are showing at TO THE FORE is a drawing made with her left hand as part of her recovery (you will see the letters LH on the paper, which means it was one she made to exercise her left hand.) Amanda has made an almost 100% recovery and continues to paint. 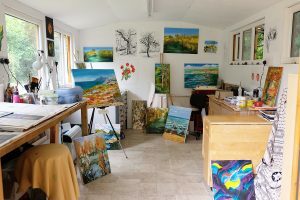 She is currently working on a new series of paintings and drawings in response to the colours, light and textures of the Isles of Scilly, based on two recent research trips to the islands. See the resulting works at this year’s Frome Open Studios trail, details TBA. Mount wouldn’t exist without Amanda: she is Simon’s mum. Knowing that Simon enjoyed making frames while studying for his photography degree, Amanda bought an entire framing kit from a retiring framer. In the hope Simon would frame her work, she then had a shed-workshop built for him in her garden. Simon dutifully set to work in his spare time. Amanda’s friends and art-group associates soon began to use Simon for their framing and word got around until finally Simon went full time and started Mount. The rest is history!